Blackfish are a serious fisherman’s fish. Some of the most enjoyable fishing I have ever done in my life has for blackfish. They are quick, cunning and smart. When hooked they will dart for structure to cut your line. The blackfish, a.k.a. tautog, tog, or bulldog (Tautoga onitis), ranges from Nova Scotia, Canada to South Carolina. They live along the coast in rocky areas and may be found near pilings, jetties, bridges and wrecks. It is commonly taken at fishing reefs in the Atlantic Ocean, Long Island Sound and off south of Long Island. I have fished tied to bridges and piers in Jamaica Bay and scored big time. Blackfish can grow to 3 feet and about 25 pounds. The marine fishing records of New York reveal that the record tautog caught is 22.53 taken in 2014. Usually anglers catch fish from 2 to 8 pounds in these waters. Blackfish (tautog) are among the most crafty, tough, elusive and delicious fish in our local waters. Blackfishing forms a camaraderie among those who do it regularly. These sharpies go out in sometimes hard weather to offshore wrecks in search of their prey. Many boats have a crew of regulars that goes out weekly. Check out the Ocean Eagle V on a Tuesday trip if you want to see and hear a group of sharpies that knows how to catch fish and a masters at busting balls in an artful way. Captain Gregg Nardiello offers a wry live commentary to the festivities. They also have a killer galley. This kind of fishing is rough on tackle and fishing gear. Use a stout boat pole and a reel that can crank them off the bottom fast. I stick with a conventional reel, but many guys use spinners. Your stick must be tough, but sensitive to pick up on the bites. Sharpies are always on the lookout for tips that gives them an advantage over fellow fishermen. For many guys, these trips must result in bringing home meat to freeze and have during the long, cold winter. It is rare to get such nice weather this late in November and we count ourselves lucky. Fishing is steady with a lot of shorts. We got a couple of keepers and feel lucky. The bounty, if you fish hard and are lucky to catch a keeper or two, is a firm, sweet fish that can stand up to many recipes. I’ve sautéed blackfish with capers and butter, poached it in white wine and beer battered and deep fried it. Simple preparations highlight blackfish’s naturally mild flavor and firm texture. In this preparation I add it to a spicy Szechuan soup I make from scratch. Options: dried shrimp, scallops, clams or crab can be added. If you desire a rich “fishier” taste save the fish heads and scraps for your stock. 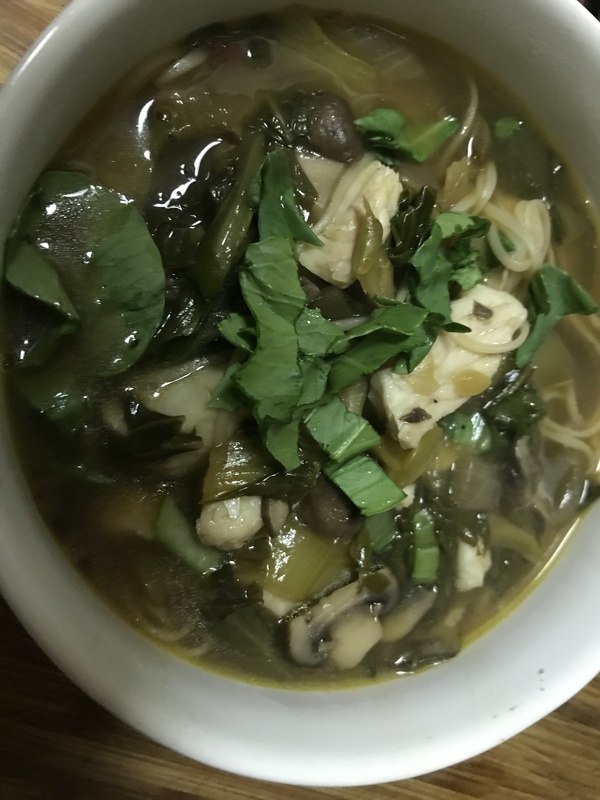 To make your soup stock, saute onions, mushrooms first until onions are translucent and add bok choy into a pan until wilted. Deglaze with wine and add seafood stock and the other ingredients. Bring to a brisk simmer and add noodles. Add the fish at very end and simmer for five minutes without stirring to much (it may break up fish. Garnish with a little bok choy and serve hot.